Click for a brief summary of the book of Obadiah. I have dwelt in the clefts of the rock, and have asked, “Who shall bring me down to the ground?” And the Lord has laid me low. I have mounted on high with the eagle, and made my nest with the stars, and the Lord has reached and taken me. No pride is safe from Jehovah; but all humility is His delight. 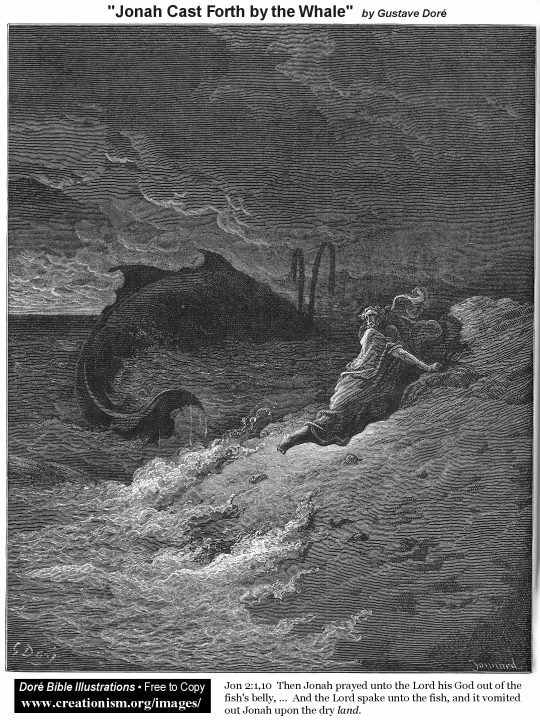 Click for a brief summary of the book of Jonah. I thought to escape duty, and a harder duty followed me. I would run away from God, and God piloted the vessel on which I sailed. I drew myself into concealment, and I drew Jehovah in with me. There is no fleeing from Thee, O God! My very flight is a summons to Thee. Out of the depth I cried to God. His waves and His billows were over me. His storms were round about me. I was afraid of His wrath. But I had learned to be even more afraid of myself. From my inner storms I turned to Him, even in His anger; and I found a haven of peace. Let me declare the will of the Lord. Though I am small and the city is very great. Though I am feeble and my enemies are very strong. Though my wisdom falters and my foes are shrewd. Let me proclaim the will of the Lord and all men shall fall down before it. How much more kind is God than men! He is patient while men strike, long-suffering while men berate. He is not too proud to forgive. He relaxes His penalties without fear for His authority. The vast sphere of the universe, and all therein, is my gourd to teach me the goodness of God. Click for a brief summary of the book of Micah. It is the Lord, who will witness for me or against me. If for me, though all men and angels condemn me, I shall be safe and honored. If against me, though the universal voice applaud me, I shall go down to the everlasting shame. Where is my warrant for my pride? Why do I walk haughtily, the time being evil? Have I not sinned enough to bow my head? Should not my transgressions bend me to the dust? Are my words weighty words? Yea, if the Lord be upon them. But if only I am borne thereon, any zephyr may carry them, and zephyr may blow them away. It is a great thing to speak the words of the Lord. There is no greater fortune to the sons of men. Who shall make me afraid? The Lord’s word is my bulwark! What attack shall confound me? Jehovah’s promise is my fortress! My home is an impregnable castle though only a hut, if it is God’s home as well as mine. But little among the thousands am I, as Bethlehem among the cities; but though I were as Nineveh I am nothing, and though I were as Babylon I am emptiness. Cometh the Lord from my life? That shall greaten it! Spring His deeds from my dust? They shall be my glory! They are three heavy things that the Lord requires of me,–justice, and mercy, and humility! Heavy, because they require nothing of me but love. Heavy, because they mean only unselfishness. Heavy, because they would be so easy to one in whom dwelt the Spirit of Christ! I will bear the indignation of God. I will not chafe against His penalties. They are deserved penalties. It is an inevitable indignation. I will wait till He Himself plead my cause. I will wait, for the divine indignation will speak for me, and the divine penalty will be my advocate! Click for a brief summary of the book of Nahum. The Lord is my strong hold. The strength of all that come against me is of Him, and subject to His permission. He that holds me holds them from me. What folly are the poor defenses I contrive against them! If the Lord come up against me, farewell to my proud possessions! They melt away like morning vapor, or like shadows before the sun. My jewels dissolve, my houses crumble, my robes vanish. Woe to me and mine, in the day when the Lord comes up against me! These whom the Lord has overthrown–let me consider; Am I better than they? Are my sins less? Is my pride less? Is my obedience greater than theirs? If they fell under deserved penalty, how shall I escape? Click for a brief summary of the book of Habakkuk. Am I one whose might is my god? Do I sacrifice to my net and burn incense to my drag? Is my work my deity, do my achievements fill my pantheon? Yea, I need no wooden image to know the guilt and folly of the idolater! Let it be my livelihood, my faith; that whereby I get goodly gain, and day’s wages as the year is long. Let it be my life, my faith; that of which I breathe, that on which I feed, my pulse-beat, my vivifying joy. I am not just, but I am justified; and in that faith I live. I will not live in the valley while I may live on the mountain. I will not mourn while I may rejoice. I will not rear my mountain, for it is already uplifted. I will not climb my mountain, for the Lord will place me on its summit. Click for a brief summary of the book of Zephaniah. In the presence of the Lord I am to hold my peace. When His decree goes forth, my very heart is to be acquiescence. When He upbraids, I am to make no reply. My condemnation is fed by my complaint. Am I one that says in his heart, “I am, and there is none else beside me?” Is my soul the joyous city that dwells carelessly? Am I heedless of others, reckless of myself, scornful of my God? Then shall my life become a desolation, a place for beasts to lie down in! When shall mine be the pure language, that calls upon the name of the Lord? When shall mine be the fruitful language, that issues in consenting service of God? No other speech is worthy of Thy son, O my Father! Thy name includes all that is high, and beautiful, and strong. Be Thy name my language forever. Click for a brief summary of the book of Haggai. If my wealth is for myself, it is kept in a bag with holes. If my house is for myself, it will not shelter me. It is never a time to dwell in ceiled houses while the Lord’s house lies waste. And the house of the Lord is love. I have no courage in me. My heart is not in me. I would not have my heart in me; I would rest it on the Lord. Jehovah shall be my courage and my strength. When I am my own courage, it is as water. Click for a brief summary of the book of Zechariah. Though I am distressed, my prosperity shall yet spread abroad. Though I am in despair, the Lord will yet comfort me. Though I am outcast, the King of kings will yet choose me, even me. And in the assurance of what is to come I will now lift up my head. The Lord shall be the glory in the midst of my life. It shall be a burning glory, purifying all that is base. It shall be a shining glory, beautifying all that is ugly. It shall be an enlarging glory, ennobling all that is small and mean. All this will the Lord be to me. Surely I was a brand in the fire. The flames leaped upon me. Passions devoured me. They breathed hot breath against me, and my soul entered the horror of death. But surely I am a brand from the burning. A Hand has been reached forth. It has taken me from the fire, soiled, black, charred,–ah, the beautiful white Hand! When I run by my might, how am I distanced! When I fight by my power, how am I over thrown! When I shine by my light, how I flicker and go out! Feed Thou me, mysterious flowing Olive Tree! Not by my might or power, but by the might and power of Thy Spirit, O Thou only Strength of men. When shall my wickedness be cast into a measure, and be borne away? When shall a weight of lead be cast upon it, to bury it forever? Ah, when I will! For the ephah is ready, and the weight has been provided. If I am to wear a crown, the Lord is fashioning it. The crowns I am wearing now shall fall to dust. The earth made them and the earth retains them. There are crowns that fall from heaven, and carry their crowned ones thither again. Did I fast, and oppress the widow? Did I pray, and withhold compassion? Did I sing anthems, and imagine evil against my brother? Therefore is my fast become a curse, and my prayer a pestilence, and my song a hissing in the ear. Before the Lord can enter my house, I must enter the house of my neighbor. Truth I must take with me, and peace and good will. Then may God enter my house; but He enters no house that loves no neighbor. I am a prisoner, but a prisoner of hope! Deep is my dungeon, but not too deep for the sun. I have dwelt there long, and may dwell there longer, but I shall not be there forever. And when I look back, it will be upon the dark entrance of Paradise! I will remember Jehovah in far countries. Far from His house, I will make a sanctuary among the heathen. Far from His peace, I will remember Him in the tumult of battle. Far from His joy, I will not forget Him though wretchedness surround me. And in the remembrance will be joy, and peace, and home. Though I think I have no sheep, yet I have some. Others look up to me, others depend upon me. No man goes utterly lonely through the world. Am I the worthless shepherd, whose are the woes? or the faithful shepherd, whose are the joys of the flock and of their Owner? Straight through the loving heart of my Father my sins have pierced. The blood of His anguish has flowed. The horror of my iniquity has been upon Him. Ah, that one look upon Him whom I have pierced! It will burn in my mind forever. Foul indeed am I, and full of all uncleanness. It is not enough to wash me without when I am filthy within. The Fountain must be within me, and it must not merely lave me. Yes; and the Fountain will spring up within me at a wish. I care not for the day, if the sun break forth in the evening. Let the last sky be cloudless, and the whole day is fair. So shall it be with me, according to Thy word, O God. After all storms and darkness, at evening time there shall be light. Click for a brief summary of the book of Malachi. The best for the Best! The best of my time, and not a hurried fragment hastily torn away. The best of my talent, and not what is unmarketable. The best of my goods, and not the worm-eaten. The best for the Best! Anything less leads to the worst. The next man I meet has my Father for his own. The same love of God yearns out for him that awaits me. The same heaven, the same hell, are possible for him. Why, then, do I not fly to my brother? Why do we not walk together, at least a little way? My possessions are not mine. If I call them my possessions in my heart, it is because they have come to possess me. All that I have is the Lord’s; and shall He not have His will with His own? What is the whole tithe but the whole? And if God return nine tithes, how liberal is He! Upon the first chapter of the Old Testament the sun arises, and upon the last the Sun of Righteousness. Between the two chapters how much of sin, how much of terrible warning! But in the last chapter is healing. My healing, as well as for the Israelites, for upon me also the Sun has risen.